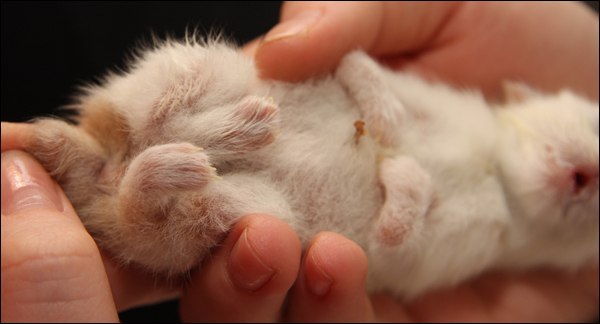 Occasionally a kitten is born with one or more legs that appear to be "twisted" due to a condition called Contracted Tendons. 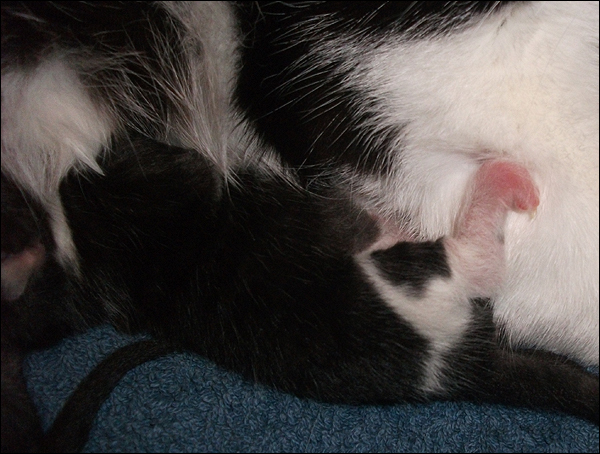 It is thought that if the kitten's legs are crowded when it is enclosed in its amniotic sac inside its mother, or if the legs lay in the wrong position while the kitten is developing, the legs can grow twisted. 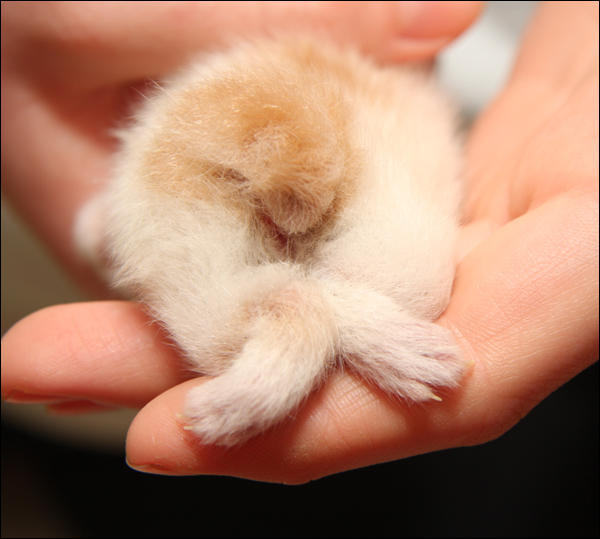 A kitten can have just one leg twisted, although more often two front or two hind legs are affected. The degree of twisting of the leg can vary from mild to severe, from only a slight twisting of the leg to a twist of almost 180 degrees. The leg may just turn inward or it can actually turn AND twist upon itself. Straight, over-extended leg. The joints are stiff and will not bend. There is no twisting. 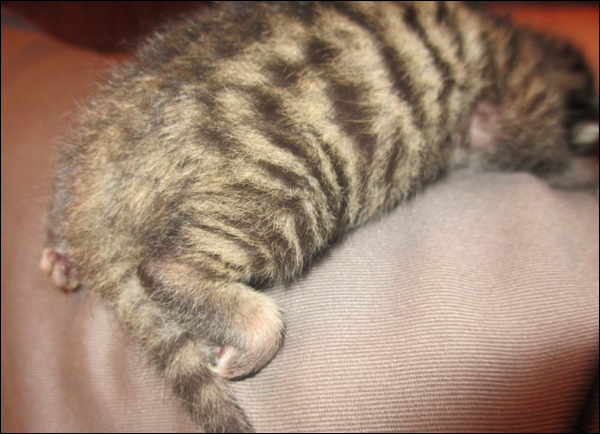 Normal, flexible leg with curled under paws that will not bend into a normal position. Stiff leg with curled under paws that will not bend. The leg is bent under at the wrist and twisted inwards. The degree of bending and twisting may be slight or the front leg may be twisted almost 180 degrees. The hind leg is bent backwards from the point of the hock. 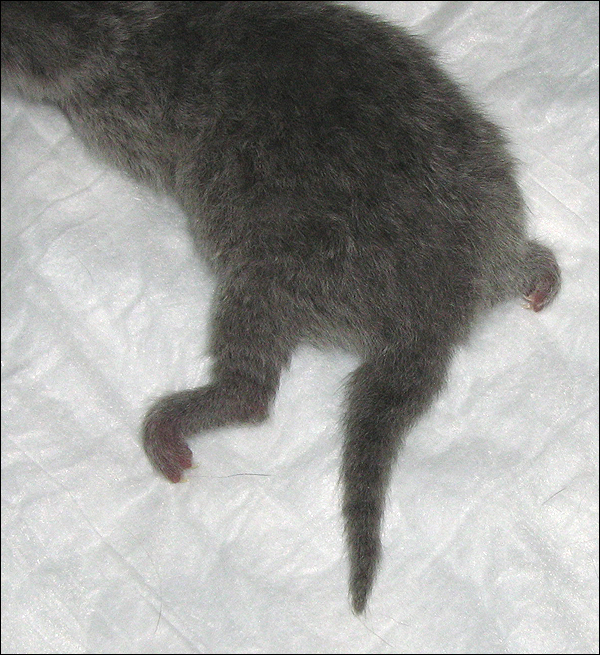 The hind leg turns inwards from the point of the hock so that it crosses underneath the kitten's belly. The degree of the turn inward can be mild or so severe that the hind foot is twisted upside down. 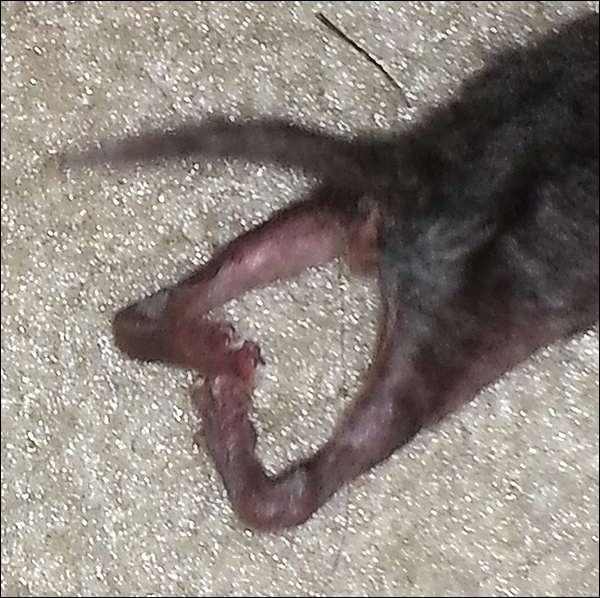 The entire lower hind leg is twisted inwards in a semicircular fashion from the hock down. The twisting may be slight or may turn through almost 180 degrees so that the hocks face forward rather than back and the leg gives the appearance of being put on backwards. 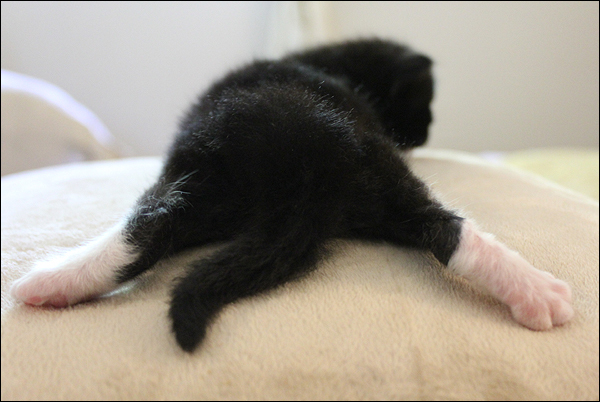 The mildest form of a contracted tendon results in a kitten born with over-extended, straight legs. There is no or little evidence of twisting or turning of the limb. The legs do not appear deformed or misshapen, however the joints do not bend. 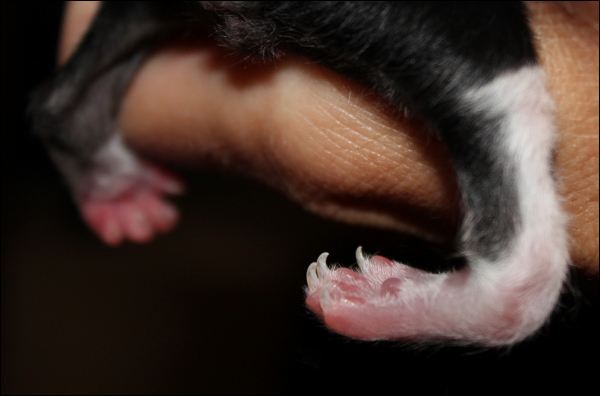 Another mild form of contracted tendons involves the curling under of the paws. 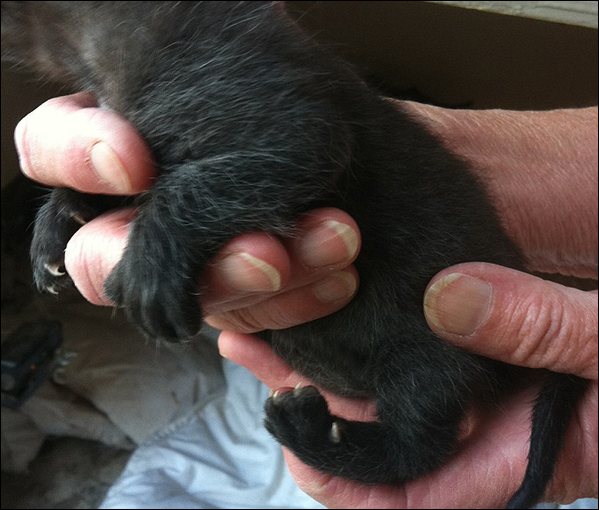 The paw resists being straighted into the normal position. The curled paw may be the only thing wrong with the leg or it can also be associated with stiffness or twisting in the rest of the leg. 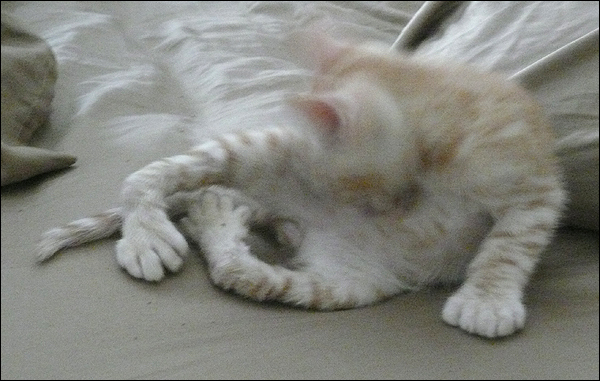 however the paw is curled under and resistant to movement. The twist in a front leg is almost always at the "wrist" with the leg twisted inwards. It is as if the leg was bent normally down at the wrist, and then twisted inwards. The bend and twisting can be less than 90 degrees (mild to medium) or more than 90 degrees (medium to severe). Contracted tendons on a hind leg usually affect the leg from the hock joint down to the foot. The leg can be twisted inwards from the hock towards the center of the body or it can be twisted backwards. This photo clearly shows the hind leg with a 90 degree twist inward from the point of the hock. 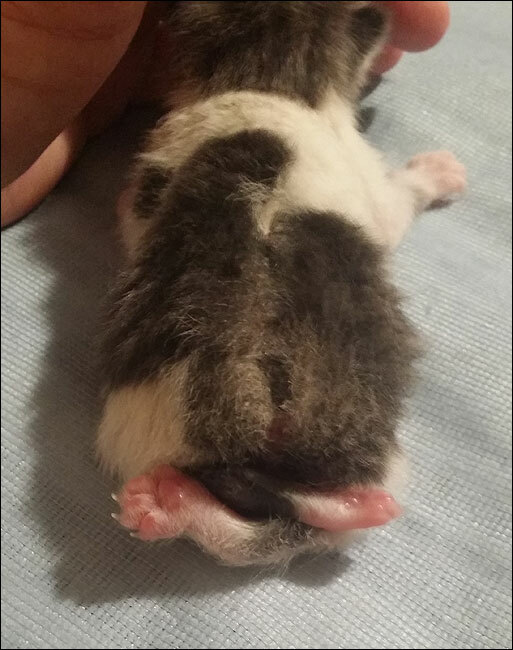 This kitten was also born without a tail. 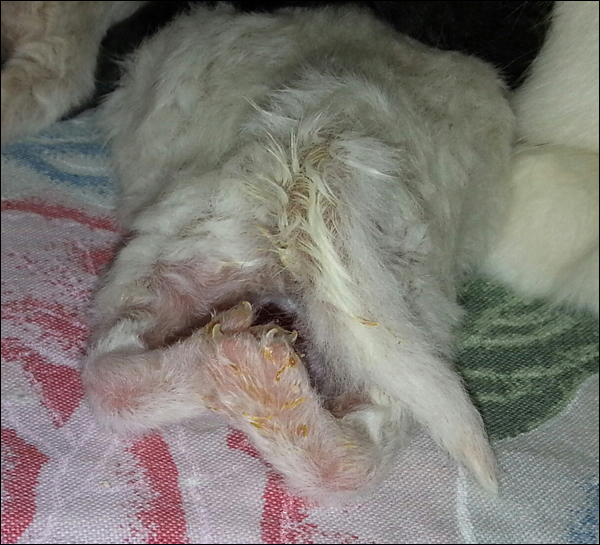 is turned to the front of the leg which makes the paws appear upside down. These back legs have a 180 degree twist at the hocks and are locked in a yoga pose. 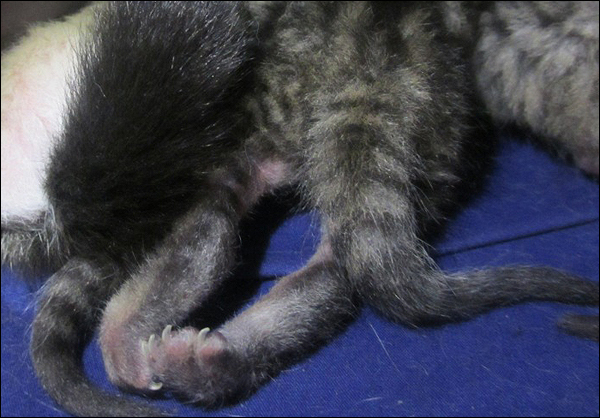 This 7 week old kitten has severely twisted hind legs that had not been treated. 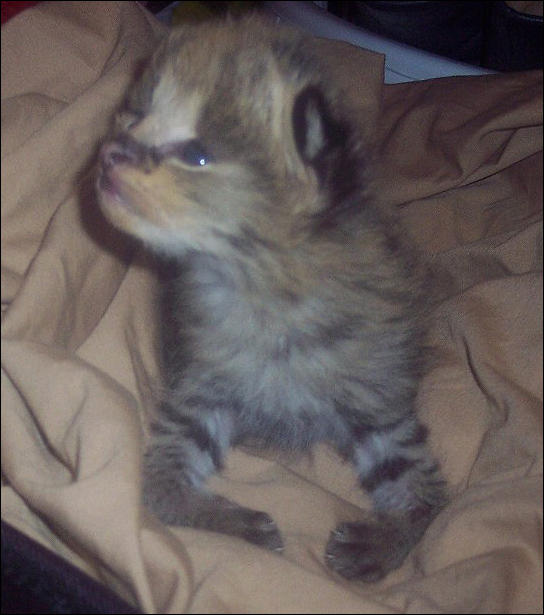 If a kitten is born with other conditions in addition to what appears to be contracted tendons, it may have a congenital deformity rather than contracted tendons. 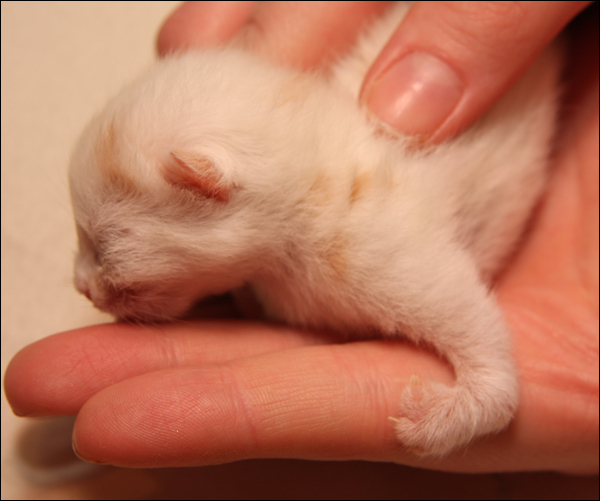 An x-ray will confirm whether the kitten has a bone or developmental deformity. If it is a congenital deformity, physiotherapy will probably not correct it although bracing and/or surgery may improve the condition. 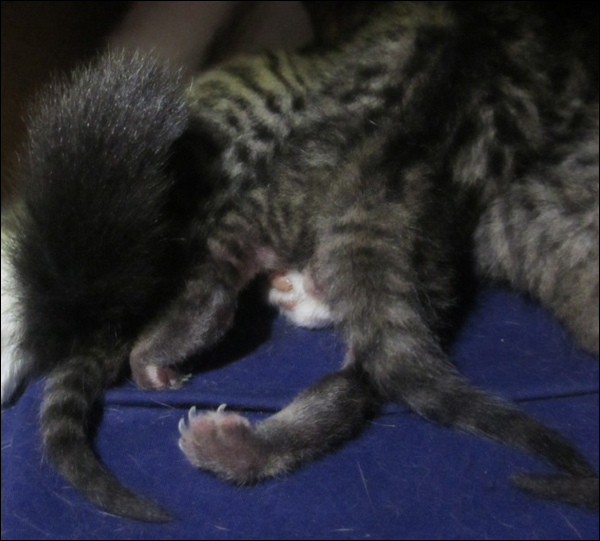 This kitten was born with all 4 legs twisted plus a bobbed tail. The joints were stiff and twisted on the front legs but loose and twisted on the hind legs. 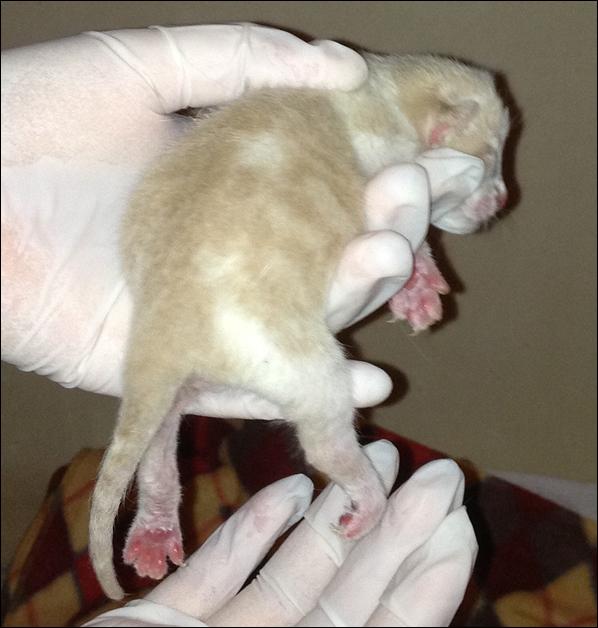 x-rays were necessary to ensure the kitten did not have a congenital deformity.